Hiking in the UK is definitely an under-estimated holiday activity for tourists. There are many trails, mountains and coastlines to explore all offering stunning scenery or historic significance. Whether you are an experienced hiker or a backpacking beginner, there’s at least one trail in the UK you should try. Here are five of the top UK hikes you should add to your bucket list. This path spreads over 84 miles, from Newcastle to the Solway Firth. It might not be the prettiest path in places, however it is an iconic trail following the ancient Roman ruins. Charity trekkers and bucket listers often walk the length which takes approximately a week to complete. Staying along the trail is easy too with many accommodation options including campsites, B&Bs and hotels. You can take a guided tour with a local company such as these activities with TOAD who will arrange the details for you. As the highest mountain in Britain it’s a popular feat. The main route up the mountain is relatively straightforward but can be quite difficult in places. The just over ten-mile climb will take between seven and nine hours to complete. Start at the visitor centre and prepare yourself for the dramatic views across the cliffs and highlands. Once at the top you’ll have that rare feeling of achievement you can only get from climbing a mountain. This route, often described as the Yorkshire three peaks challenge, covers the peaks of Pen-y-Ghent, Whernside and Ingleborough. Set in a triangular walk of 24.5 miles the route can be accessed at numerous points and when you finish the trail you are back at your starting point. The whole route will usually take around 12 hours as you hike through the Pennines, the River Ribble and Yorkshire Dales National Park. Try the challenge on your own or join a group trek, the route is a busy and popular one so you won’t be on your own. If you want to explore the stunning coastal scenery that Cornwall offers then taking a hike along part of the South West Coastal Path will give you just that. I’m not saying you should try to conquer the whole 630 miles in one go, stretching from Minehead around to Poole Harbour in Dorset. But there are many parts of the route you can try such as hiking from Combe Martin to Woolacombe which is 14 miles of path along the coast. 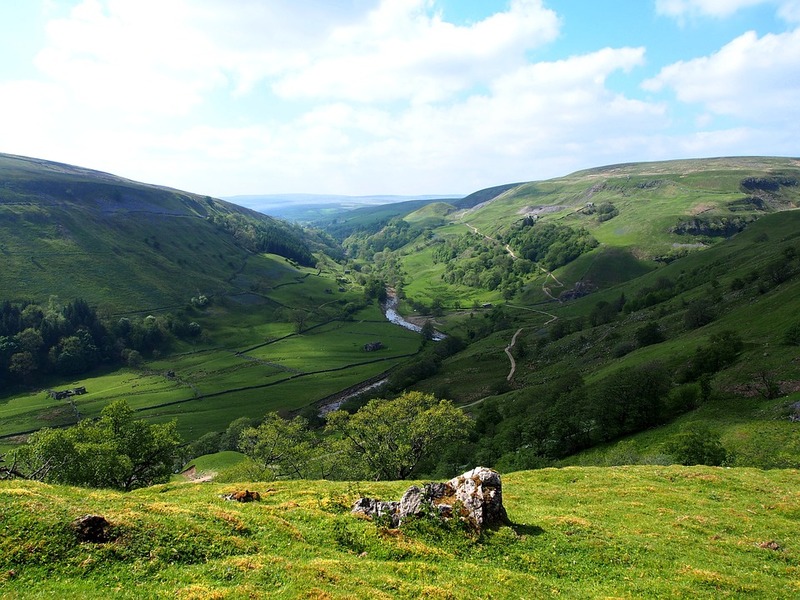 The Peak District, as the name suggests, is full of wonderful walks and spectacular natural views. Stanage Edge is a natural cliff which looks out onto the Derwent & Hope Valleys, Mam Tor and Kinder Scout and famous for its inclusion in the film version of the novel Pride and Prejudice. A nine-mile walk will take you from the village of Hathersage, past another literary interest North Lees Hall. You might also spot log abandoned millstones and grindstones nodding to the industrial history of the area. So, as you can see there are many varied, adventurous and scenic walks and hikes across the UK. If you want to take in the real countryside of the UK, travel environmentally friendly and avoid the bustle of cities, then a hiking holiday in the UK is perfect for you.